MP TURNS SUPRESLEUTH to fathom the case of the ‘missing’ village green. Although Haughton Green in Denton, has a green at the heart of the old village – called the Tommy Todd – it wasn’t apparently registered as a village green according to the Register of Town and Village Greens held by Tameside Council. However, Denton’s MP, Andrew Gwynne, had recently uncovered some vital clues online which suggested that Tommy Todd had actually been officially registered as a village green using legislation introduced in 1965 to formalise historic greens and common land. Andrew’s intervention led to a formal investigation, with enquiries made to national government and to the Lancashire and Greater Manchester County Record Offices to help piece together the missing bits of the jigsaw. 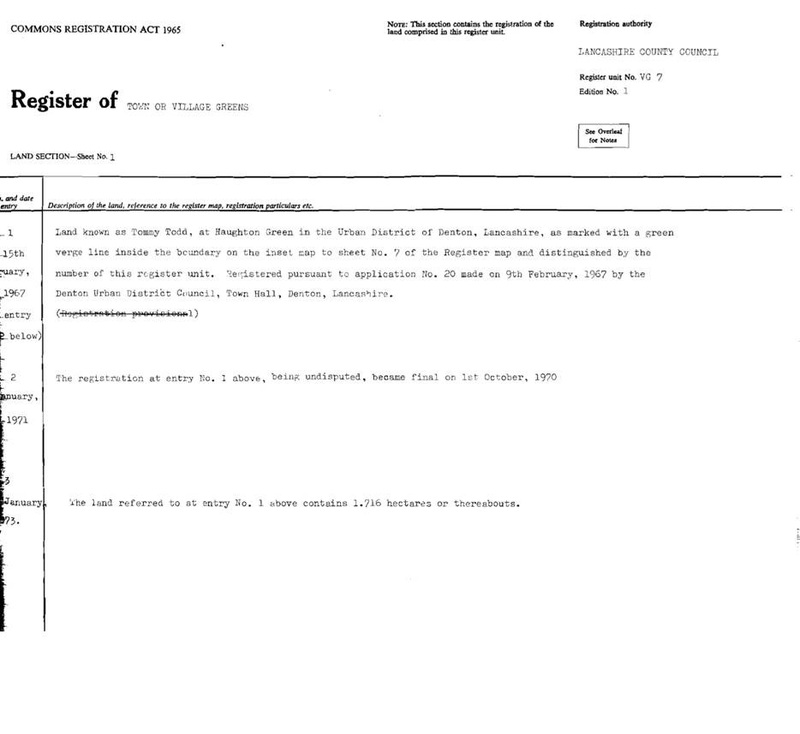 And the evidence has now been uncovered: Tommy Todd was indeed registered as a Village Green using the provisions in the Commons Registration Act 1965, on the request of the former Denton Urban District Council to Lancashire County Council in February 1967, and the entry in their Register of Town and Village Greens, being undisputed, became final on 1st October 1970. Haughton was a separate township to Denton. It covers an area on the east of the modern-day town of Denton, from the border with Audenshaw in the north to Haughton Green and Haughton Dale in the south. Denton and Haughton were amalgamated in 1884 to form the Denton & Haughton Local Board, which became the Denton Urban District in 1894, and a part of Tameside Metropolitan Borough in 1974. In 1884, Haughton’s village green was known by the name of ‘Betty’s Park’. Tommy Dodd was a large stone plinth and gas lamp, which stood at Denton Market Place. When Denton and Haughton were amalgamated in 1884, it was decided to move Tommy Dodd to Betty’s Park, Haughton Green, as a symbol of unity (see the photograph at the top of the page). Local wags, and the media, dubbed the event as ‘the marriage of Tommy Dodd and Betty Haughton’. Tommy Dodd was dismantled in 1905, as it prevented sport from being played on the green. However, the name lives on – ever since, the green has been known as Tommy Todd (a corruption over time of Tommy Dodd). Tommy Todd was formally registered as a village green in 1967 and this was finalised in 1970.